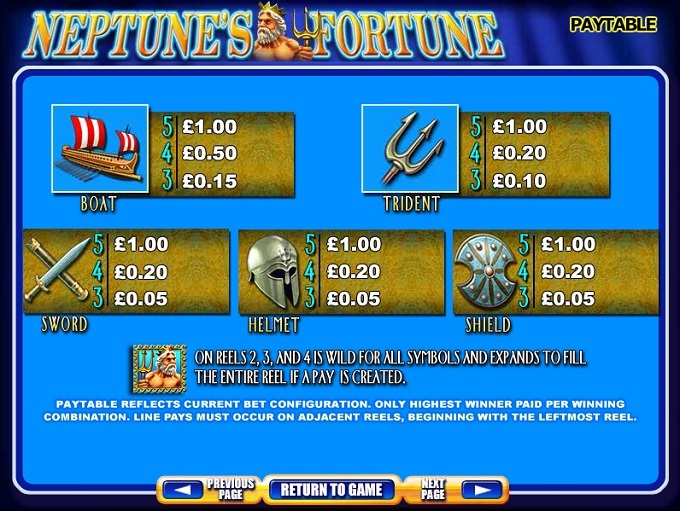 Neptune’s Fortune is a game inspired by the Ancient Roman gods, specifically by the Roman god of the sea. He was called Neptune by the Romans, while the Greeks used the name Poseidon for the same ruler of the seas. 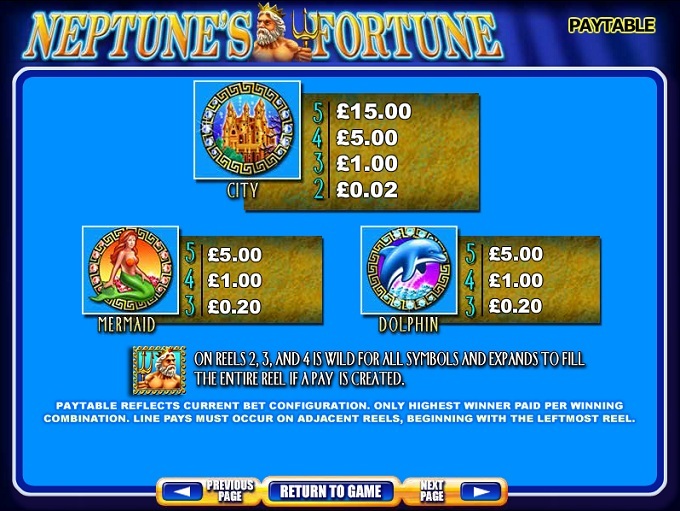 In typical slot machine fashion, the theme was mixed with the fortune angle, to make sure that every player will find something to like about it. The symbols are all related to the underwater world, to mermaids, but also to explorers that braved the Mediterranean sea, in row ships. The soldier angle actually has a decent number of the game’s symbols. 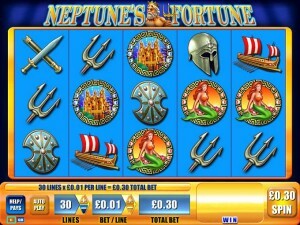 Neptune’s Fortune gets 5 reels, 30 win lines and it can offer top prizes of $7,500. There are free games, scatters and wilds inside, as its features. 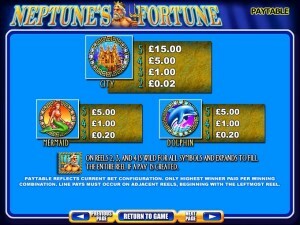 It’s not a bad looking list of features that Neptune’s Fortune has to give you, as it starts with an expanding wild, an unusual sight for a WMS game, and continues with more common scatter symbols and with free spins. Neptune, holding a trident, is the image of the wild feature. Even better, it’s an expanding wild, and if this gets you a new win then the symbol will take over the entire reel on which it appears. The unfortunate part is the presence of the wild on only three reels (2, 3 and 4). It’s obviously not going to be a source of prizes directly, but its capacity to expand should come in handy. As for the scatter symbol, what better image for it than a Treasure Chest, the most common choice in games themed around the ocean or pirates. This is a scatter, so it doesn’t matter where on the reel it makes the appearance, but the game still needs them to be on adjacent reels and going from the left. A plus would be the fact that an expanding wild can substitute for the scatter as well. 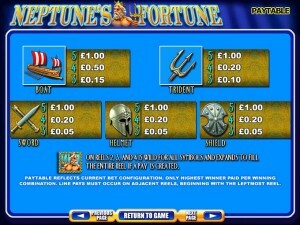 You’re going to get paid between 2x and 50x the total bet when between three and five Treasure Chests are on the reels. 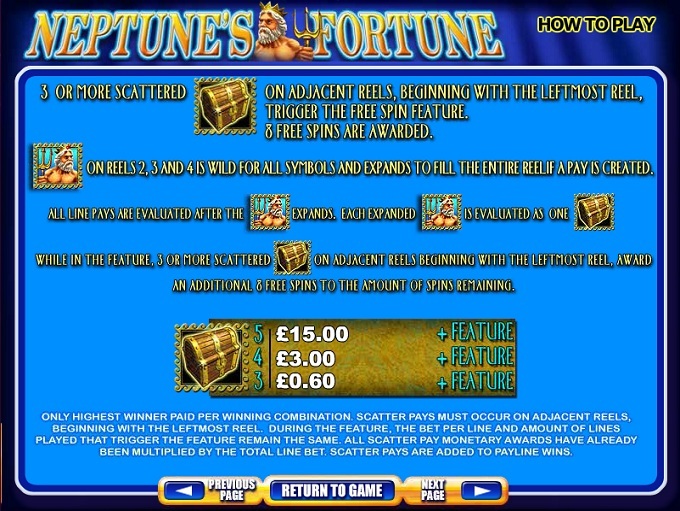 The slot’s Treasure Chest scatter is responsible for starting out the free spins as well. 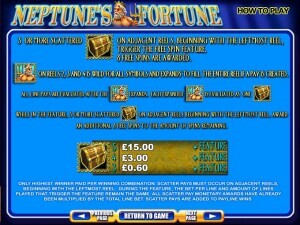 3+ Treasure Chests will add to the cash prizes I mentioned above a number of 8 free spins. Retriggering the free spins requires the same 3+ scatters to be present again. Your wagers will have between 1 and 30 coins, depending on how many lines you want active. The coins will have a value that you choose, the range being $0.01 to $5. The largest possible bet is worth $150. If you get the top prize, you will be offered 1,500 coins, with $7,500 being their maximum value. You can also get the same amount from the scatter symbol, which awards up to 50x the total bet as a prize. The game seems to be inspired not just by Neptune and the ocean’s creatures, but also by the explorers that braved the Mediterranean Sea in a trireme, a row ship. Plenty of symbols used here show off pieces of equipment that the warriors had on them, but the main symbols still have to deal with the Neptune angle. Symbols: Neptune (wild), Treasure Chest (scatter, 50x total bet), Underwater City (1,500 coins), Mermaid (500 coins), Dolphin (500 coins), Boat (100 coins), Trident (100 coins), Sword (100 coins), Soldier’s Helmet (100 coins) and Shield (100 coins). The theme is not very original, but it makes up for it with its use of only themed symbols, with its expanding wilds and the free spins it offers. 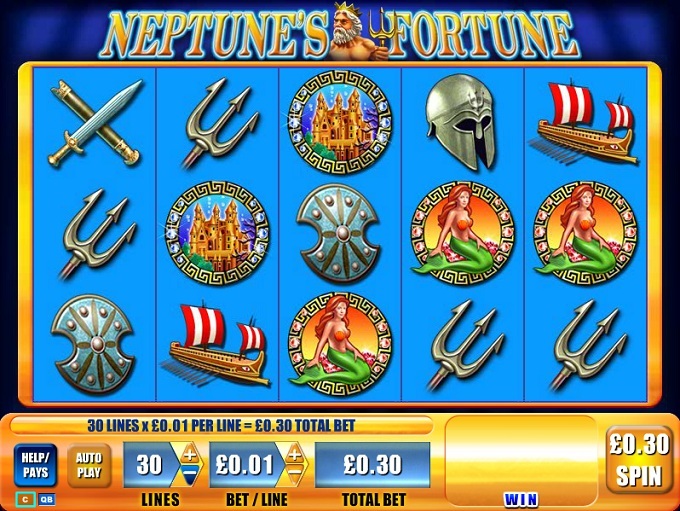 You will find Neptune’s Fortune at any online casino which chooses to use software from WMS, playable either for free or for real money.